For more than 70 years, student and faculty musicians, the Terre Haute Symphony Orchestra and internationally known performers have made music inside Indiana State University's Tilson Auditorium. Now, a visual performance will be on permanent display outside Tirey Hall, the former student union building that houses the auditorium. "A Chorus of Trumpets," will be dedicated Monday on newly renovated Rankin Plaza, the courtyard area between Tirey, Rankin and Parsons halls on the east side of the campus quadrangle off Seventh Street. Artist Howard Kalish of Brooklyn, N.Y. conceived the 10-foot by nine-foot outdoor sculpture to complement the indoor venue originally known as "Tilson Music Hall." "Upon visiting the plaza, it became clear to me that a globe-like form would be ideal for the site," Kalish said. Since Tilson Auditorium is in operation at night, Kalish said he designed the sculpture to respond well to artificial lighting. The stainless steel and aluminum artwork features translucent tinted urethane elements that evoke the shape of trumpet bells. "The way they work together, the interplay of colors, is analogous to a musical composition - hence the title," he said. "A 'chorus' is heard in a concert hall or theater, which links it to Tirey Hall, as a kind of visual fanfare for the performances there." His sculptures "work" in most settings, but surprisingly and differently in each case, he said, adding that designing site-specific works allow him "to interact with architecture and landscape in novel and visually memorable ways." 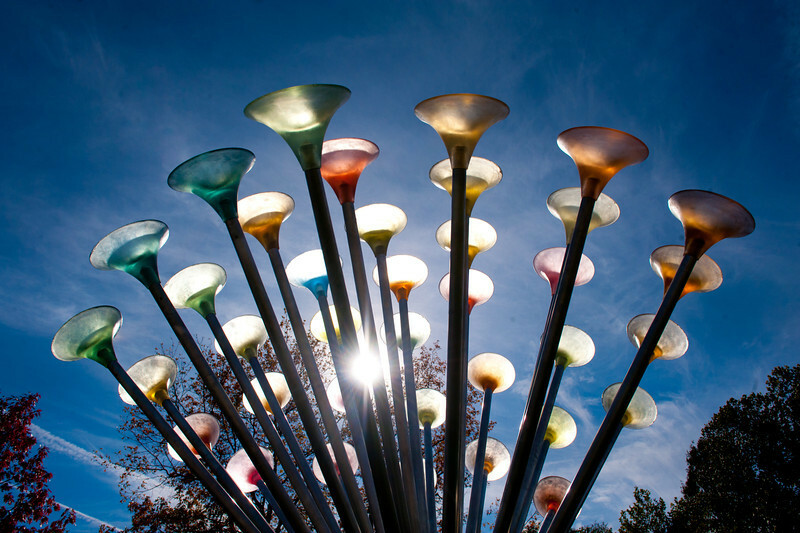 Installation of "A Chorus of Trumpets" continues Indiana State's commitment to expand the presence of art on campus and promote arts in the community. "We are pleased to add another piece of sculpture to the collection of the university, particularly one celebrating music, for the community to enjoy," said Diann McKee, ISU's vice president for business affairs and finance. Mary Kramer, executive director of Art Spaces, said she has long admired Kalish's work and is "absolutely thrilled" to welcome one of his pieces into the Art Spaces collection. "Rankin Plaza is an ideal location for a work of this magnitude, close to a main public entrance, adjacent to the Arts Corridor, and in the heart of campus in an area often visited by the public as well as the university community," she said. "I'm impressed with ISU's commitment to public art and am excited for all of us to have this unusual and beautiful work becoming part of our city landscape." Nancy Rogers, ISU's associate vice president for community engagement and experiential, said the sculpture "is a fitting tribute to Tilson Auditorium, one of the university's iconic landmarks. Generations of ISU students and Terre Haute residents have attended and continue to attend world-class performances and lectures in Tilson. It is truly synonymous with the performing arts in Terre Haute." Rogers said Art Spaces is an outstanding community partner for the university and Kramer and the organization's board of directors have worked diligently to bring public art to the community. "The number of quality pieces installed by Art Spaces and their partners in a relatively short period of time is quite remarkable," she said. "A Chorus of Trumpets" will be dedicated at 3 p.m. Monday (Oct. 31). A reception will follow. In case of inclement weather, the reception will take place inside Tirey Hall. The sculpture is the 11th outdoor art project for Wabash Valley Art Spaces, each in collaboration with one or more area institutions. Other Art Spaces sculptures may be seen along the Terre Haute Arts Corridor, on the ISU and Rose-Hulman Institute of Technology campuses, at Memorial Stadium and in Gilbert Park. Information about Art Spaces is online at www.wabashvalleyartspaces.com, on Art Spaces' Facebook page, or by calling 812-235-2801. Kalish has been making public art for the past 20 years and has more than 25 years' experience as an art curator and teacher. He has taught at the National Academy of Design in New York, New York University and the Nassau County Museum Art School in Roslyn, N.Y.
His work can be found at such locations as Navy Pier in Chicago, Fulton Ferry State Park in Brooklyn, Roger Williams State Park in Providence, R.I. and the Federal Reserve Bank of Philadelphia. He has created sculpture parks in five communities around the country, including Urbana and Mount Vernon, Ill. Contact: Mary Kramer, executive director, Art Spaces Inc. - Wabash Valley Outdoor Sculpture Collection, 812-235-2801 or Kramer@wabashvalleyartspaces.com. A 10-foot tall by nine-feet wide sculpture will be dedicated outside Tirey Hall and Tilson Auditorium. The sculpture has a musical theme to complement the musical performances that take place inside the building.